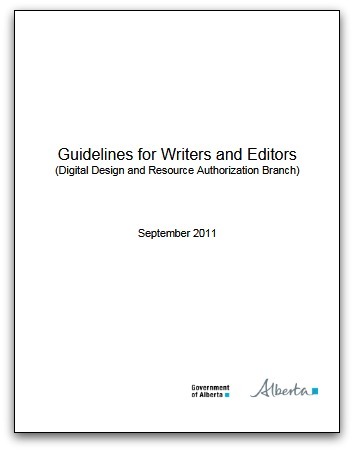 Like the Canada.ca guide, the Guidelines for Writers and Editors (Digital Design and Resource Authorization Branch) is a digital style guide. That means it is written to respond to how people read on the Internet. People read differently on the Internet than on paper, and they read differently for recreation than they do for research. So keep these differences in mind when you use any style guide. Nevertheless, the principles of plain language remain. They transcend the medium. They transcend the purpose. They even transcend the audience. If you want to be understood, you have to write clearly. This guide cleverly borrows a page from the world of advertising. Instead of creating buyer personas, it recommends creating reader personas. what kinds of unique needs and questions they might have. I find this really helps. When you sit back and picture a reader, then read what you’ve written through their eyes, suddenly it all makes sense. All, that is, except what you’ve written. You might have made too many assumptions about what the reader already knows. You might find you need to use more normal language and explain some concepts. The Guide also has us considering multiple contexts. Yes, the truly motivated reader will dig for the information she needs. But a less motivated reader might not. And then, your message is lost on them. The guide tells us to follow a radical process: organize information logically. As a natural-born rambler, this is often a challenge for me. But you notice how there is a short summary to start out each post on this blog? Start with a short summary of the entire content. I agree. It’s great advice that even I can follow. They make a list look like a list. The page looks more organized (and, therefore, easier to read). They replace the need for long-winded, convoluted sentences. Put only one idea in a sentence. Break long sentences into two or more sentences. Give your reader some relief with a sentence of 5 to 10 words. Keep sentences short and crisp. Aim for less than 14 and never more than 20 words per sentence. But the guide doesn’t stop there. It identifies meaningless words like “actually” and “basically”. It identifies unnecessarily duplicated words, such as “first and foremost” and “each and every”. And it points to where verbs can replace noun strings, such as “producing”, rather than “the production of”. Write directly to your readers. Use the passive voice sparingly. Choose informal over formal language. Write in a positive rather than a negative way.